Take advantage of better prices with the triple pack option. Grid panel is the heavy duty solution to retail display. Offering versatility and durability, Grid panel can be used as a modular system using feet, joining clips and shelves to create a hard wearing display for almost any industry. All panels sold are 2' wide (615mm) and in Chrome only. 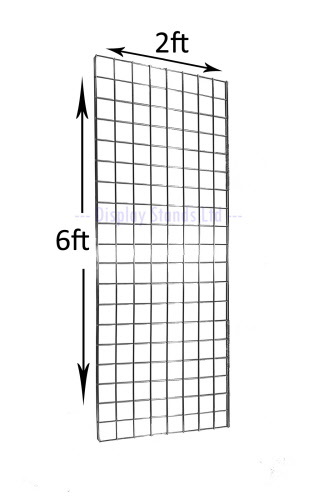 3" x 3" Grid mesh accepts all of our grid accessories available. Sold individually or in packs of three. Bespoke colours available (at extra cost). Call us to discuss your requirements: 023 92632633. Minimum quantity orders apply.